Today StorSimple Virtual Array is available exclusively for Microsoft Enterprise Agreement (EA) customers. To leverage the StorSimple Virtual Array hybrid cloud offering, we are now expanding this solution to customers who are on MSDN, Pay-as-you-go, and other subscriptions. For more details, please visit StorSimple Solution Pricing. With the flexible pay-as-you-go subscription, StorSimple Virtual Array can be used by Small and Medium Business (SMB) owners. MSDN subscribers can now run POCs or development and testing workloads. In all these cases, you can configure StorSimple Virtual Array as a file server (NAS) or as an iSCSI server (SAN) in the new Azure portal. 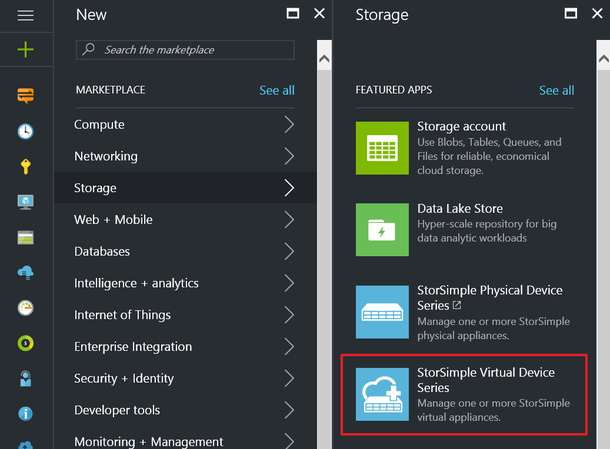 Everything about the StorSimple Virtual Array experience in the Azure portal is designed to be easy. Create a StorSimple Device Manager service to manage all your StorSimple Virtual Arrays. Remember to select the StorSimple Virtual Device Series while creating the service. For more information, go to the StorSimple product documentation. Visit the StorSimple MSDN forum to find answers, ask questions, and connect with the StorSimple community. Your feedback is important to us, please send any feedback or feature requests using the StorSimple User Voice. Should you need any assistance, Microsoft Support is there to help you along the way!